Used where the strike cannot be fitted at the edge of the frame. All ES110 strikes have pre-drilled holes for lips. 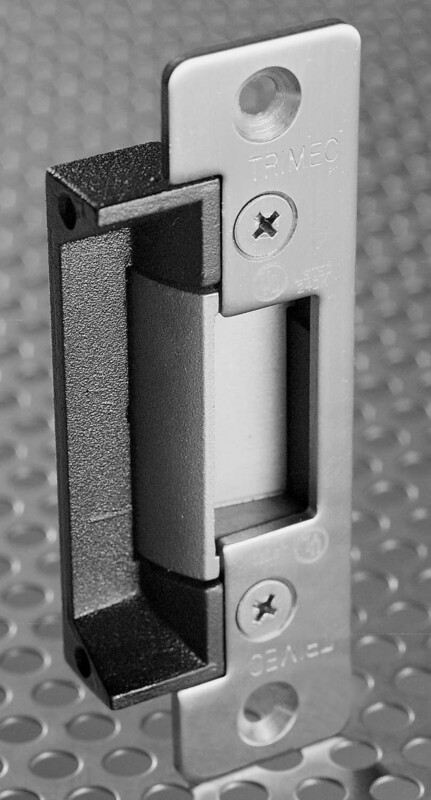 A rebate plate is available for the strike for a 13mm rebated door. Please note the lockcase will still need its own rebate component. Faceplates are available to suit the standard European style and UK style sashlocks. Dimensions shown as on the right. Please note distance between deadbolt cutout and latchbolt cutout. Also note that the plate is handed. Throwing the deadbolt will prevent access even if the strike is activated. RM1 Used where AC voltage is being used. Usually with a telephone entry system which are normally AC output.